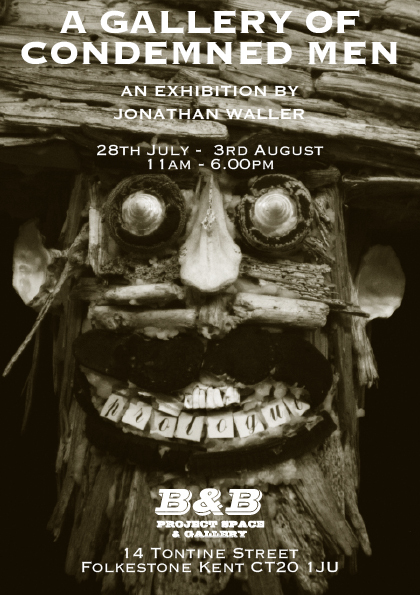 B & B Project Space in Folkestone is hosting an exhibition of new work by the artist Jonathan Waller. He will also be constructing a new sculpture in the gallery during the show with materials gathered from the local beaches. Waller has exhibited internationally and has been included in two major surveys of British and European art. He has work in the Tate Gallery, Metropolitan Museum of Art in New York and many other important collections. He is a senior lecturer at Coventry University. Entitled ‘A Gallery of Condemned Men’ and comprising works of sculpture, drawing and print, the exhibition will take the viewer on a shadowy journey into the underworld of Victorian London, through the deprivations of doomed nautical expeditions and beyond towards a satirical end in Hogarthian folly! Using a mixture of unconventional materials, the installation explores the dark themes of destiny, fate and foolhardiness through the transformative idiom of the grotesque. The exhibition opens to the public on Sunday 28th July and closes on Saturday 3rd August. Opening hours are from 11am to 6.00pm. Come and meet the artist who will be resident in the gallery.